The 40% density increase is definitely affected by the fact that the logic and cache portions of the chips aren't growing vertically. The dual-plane addressing adds some complexity but not enough to show up in rough numbers like these. So you assume the density is for the entire die and not the cells? If that would be the case, given that their 128Gb 32 layers TLC is 69mm2, this one would be 98.57mm2 and bit density at about 2.6Gb per mm2. But if you take AT's estimates of 72% array efficiency and you assume cell size and the logic remain the same size while going bigger and adding 50% more layers , you get to 85.5mm2. If they are talking 40% theoretical increase if the 48 layers die would be same size in mm2 then ,this die would be some 92mm2. So ,unless i messed up some of the math, i'm lost. 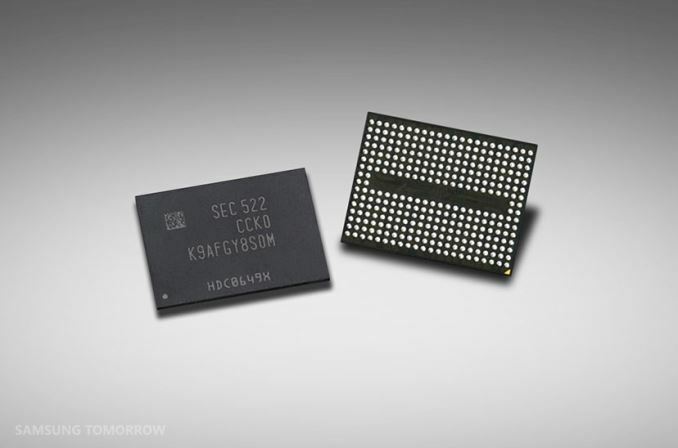 In any case it's much higher density than what Micron announced and this one fits in microSD cards too,that's a plus. We'll see how Toshiba/Sandisk compares, they got same capacity and number of layers, the process is unclear though. I don't think anyone is targetting such a number of layers (yet). Road maps talk about 48 (now), 64 (next year), 96, then 128. So, a linear growth, not geometric. They are also talking about improvements in process, layer thickness, edges, etching and precision, which should all have positive effects on density and yields. "Density is improved by about 40% while production costs only increased slightly, so price per GB will be going down."